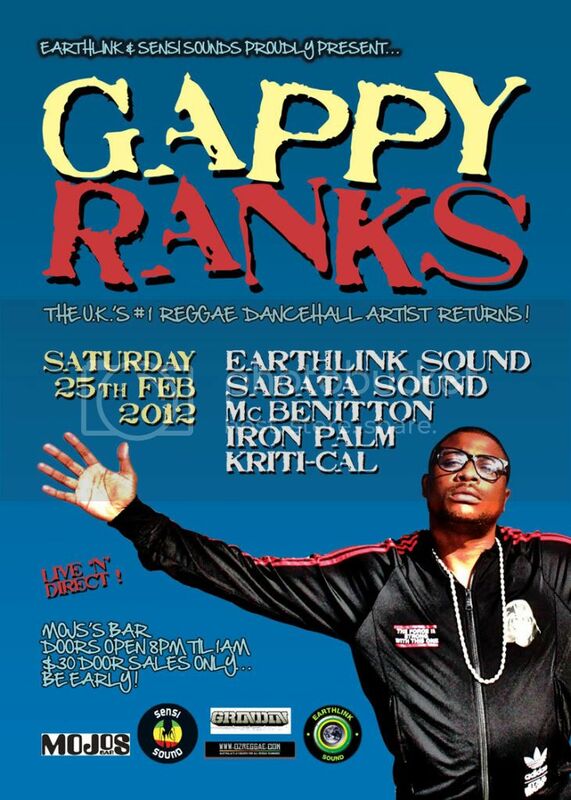 Gappy Ranks was born and raised in Harlesden UK; the child of a Jamaican father and a Dominican mother. Raised around reggae music, it was only natural that Gappy would learn his lyrical craft on the soundsystem scene, which in turn lead to his studio baptism with Stonebridge stars Suncycle Crew. The young artist soon came to the attention of the legendary Peckings label, and the result was his first local hit, "Mountain Top". The follow-up release, "Heaven In Her Eyes" took him to international stardom, and there was no looking back. A truly dynamic artist, Gappy Ranks is as comfortable on a classic roots reggae riddim as a cutting edge dancehall beat, and his live shows are a testament to this. Don't miss this chance to see one of the hottest reggae/dancehall artists in the world today, on top of his game!